Last week’s unprecedented move by the New York State Attorney General’s Office to crack down on purportedly fraudulent herbal supplements sold by major retailers has ignited a heated debate about the quality of the products tested. At the heart of that debate is whether or not the DNA barcoding technique used by the Attorney General’s Office is an adequate enough test for the identification of botanical ingredients in these herbal products. When a consumer takes an herbal supplement, it’s for a purported health benefit associated with the plant source for that product. For example, supplements made from the Ginkgo plant are consumed because of alleged cognitive benefits. The purported benefits of a plant material may be attributed to particular constituents found in specific plant parts – the root vs. the leaves, for example, rather than the plant as a whole. In addition, in order for these substances to be present in the right amounts, the plant should be grown under the right environmental conditions and processed appropriately. Often times, extraction of those target compounds is necessary to prepare some consumable dosage forms like tablets, gel capsules or liquids. For example, the botanical ingredient of a product labeled “Ginkgo” may contain an extract of Ginkgo biloba leaf. The ingredient is extracted in a manner that allows for consistent amounts of flavonoids and triterpene lactones (the compounds associated with purported health benefits linked to Ginkgo) to be present from batch to batch of the supplement. DNA is the genetic building block for any living organism, whether it’s a plant, bacteria, animal or a human being. Because DNA is the genetic roadmap for an entire living organism, it can be found everywhere in that organism. For example, the same DNA present in a plant’s stem is exactly the same as the DNA found in its roots and flowers. The DNA will be the same as long as it comes from the same exact plant. Therefore, DNA testing cannot tell us whether the part of the plant is a root, a seed or a leaf. It also cannot tell us whether the plant was grown under the right environmental conditions. However, for some botanical products it’s important that the substances are extracted from a specific part of the plant so that the desired effect from those compounds is present in the final supplement product. Extracts can come in different forms—including fluid extracts, dry extracts and tinctures, which are all mixtures extracted from a plant using a solvent (such as water, alcohol, etc.). Use of solvents and/or heat during extraction process can degrade—and sometimes destroy—DNA in extracted material (but not the constituents associated with the benefits). DNA may not be extracted in sufficient amounts or may be eliminated by further purification or refinement processes. Thus, it’s possible that when target compounds are extracted from its plant source to make an herbal ingredient, there’s no longer any detectable DNA present in the final product. In this case, it is possible that the right compounds are present in an extract but there would be no DNA present to confirm it. For this reason, the presence or absence of DNA in an extract should not be used to confirm the identity of an ingredient in the form of a plant extract. Suitable validation studies should be performed to establish whether the chosen test method is fit for the purpose. Some experts from industry and academia have been vocal about the limitations of only using DNA testing to detect the presence of herbal product components. While DNA barcoding is a valid and useful technology, it is qualitative in nature (i.e., it can confirm whether DNA is present or not, but it does not indicate in what quantity the plant material is present). Thus, chemical analysis tests should be used to determine the strength of a supplement in a quantitative manner. DNA testing does pose some unique benefits. It is the method of choice to authenticate botanical species if the botanical characteristics are no longer present or the amount of material is very limited. For example black cohosh, a plant native to North America (e.g., Actaea racemosa), differs from other species of the genus Actaea found throughout the world. While there are several species found outside of North America that are often confused with the authentic black cohosh , Actaea racemosa is the species specifically tied to purported health benefits. Using DNA testing, one can distinguish between North American and non-North American species. Quality standards for medicines and their ingredients have been developed by the U.S. Pharmacopeial Convention for nearly 200 years. Today, these standards are publicly available in the U.S. Pharmacopeia—National Formulary (USP-NF). While USP’s standards for medicines and drug ingredients are enforceable by the U.S. Food & Drug Administration, adoption of USP standards for dietary supplements is voluntary for manufactures. If a dietary supplement manufacturer claims compliance with USP, that manufacturer must adhere to all tests and specifications in a USP-NF monograph—a detailed guide that establishes quality (identity, purity, potency, etc.) parameters for that specific supplement. While DNA testing became an official technology recognized by USP in December 2014, it is envisioned as a method to be applied mostly to non-extracted plant materials and as a complement to other chemical tests. Currently, it is not referenced in any dietary supplement monograph in USP-NF. Monographs for all ingredients of the herbal products cited by the New York Attorney General’s office currently exist in USP-NF. While it is impossible to know the ultimate outcome of the Attorney General’s investigation, we do know that public quality standards, fully utilized and coupled with independent testing, can help establish products are what they are represented to be, and can enable regulators and manufacturers to agree on whether something is—or is not—in a product. Nandukumara Sarma, Ph.D., is director of dietary supplements at U.S. Pharmacopeia. 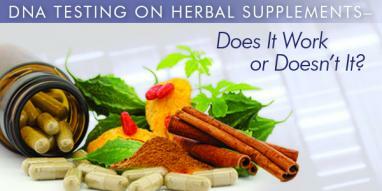 “Think Twice about Consuming Herbal Products” on USP’s Quality Matters Blog. Video of Dr. Sarma on the use of DNA techniques for identification of articles of botanical origin. “Standards without Standardization” published in Food and Drug Law Journal (2008), available via PubMed - registration may be required.